These two great performers often work together, forming an unbeatable duo. They take turns performing their favorite songs and backing each other up. 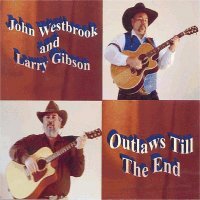 Larry plays rhythm guitar and harmonica and John is becoming a legend in the western entertainment world with his phenomenal lead guitar work. Both know many contemprary songs but are most noted for their performances of the old cowboy and western music that many of us wish we could hear more often and Larry also performs some Cowboy Poetry. 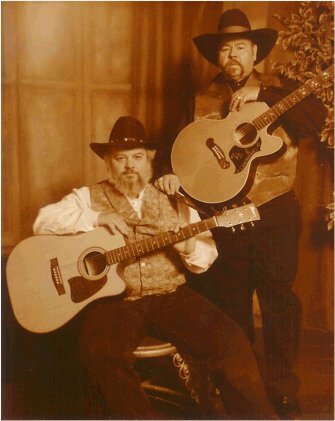 Larry is known throughout the Idaho/Montana/Wyoming area for his renditions of the old gunfighter ballads and trail songs made popular by Marty Robbins, Eddy Arnold and Frankie Lane while Westbrooks lead guitar work will leave you breathless. Both are songwriters as well as singers and they each have produced CDs for sale. John is able to provide sound equipment for any event, from living room size to a concert hall. He also has portable recording equipment available and can produce your master CD for copying. Both can help you copy, label and market your CDs also, if you wish. Larry has arranged several Cowboy Poetry Gatherings in the Townsend and Belgrade areas of Montana and can arrange a show for you, from a single performer to a complete Western Music and Poetry variety show. Each of these entertainers has their own page on this site where you can learn more about them. Also, if you Click here, you can go to a page where full-length versions of some of their songs are available to listen to, using Realplayer. Highlighted songs are now in Realplayer format and are full length. Back to the Cowboyentertainer.com home page.